I’ve been guiding and fly fishing the Brule River for a long time now and one thing I’ve learned from it all is that if you listen carefully and can hear the true song of its waters, then every trip will be special and every day will be a great day. The river is a treasure. Judge the river and its beauty by the total experience of being there-it’s worth goes far beyond the number of fish caught. That’s just the way it is for those of us that know the Brule. More than ever, every river needs its caretakers, here in the Midwest and elsewhere. Call them stewards, or guardians--men and women aware of the traditions and histories of the rivers they love; anglers mostly, who eat sleep and breathe the rewards of their sport, year after enriching year. The Brule River and the surrounding valley are home to many characters. Some are known as fantastic fishermen, some are known for other talents such as dog sledding, pie making, maple syrup you name it. Two anglers¸ Greg Lonke and Dennis Schumacher have stood beside the Brule through thick and thin, through big runs of fish and sparse runs. They are stewards of the Brule, generous of spirit and always ready to help the novice learn more about their sport I have listened to their stories for the better part of twenty years—some of them more than once! Lucky is the beginning fly fisher who is taken under their wing and filled with information and inspiration buy the light of a campfire next to the river of their dreams. Newcomers up their stories like a sponge. Both men are exceptional anglers and find steelhead in water that others pass by, and they are willing –with a few secrets held back—to share with strangers. Descriptions by campfire light of storied stretches of the Brule – Bachelors, Red Gate Annie Nimies — can stir the soul but the challenge of actually finding steelhead can be intimidating to the inexperienced. Dennis Schumacher (also known as “Big Dog or BD”) has been fishing for wild steelhead since the mid 1950’s He landed his first fish on a fall morning in Minnesota’s Knife River back in 1956. His passion for steelhead continued and he developed in to a very skilled fisherman. He lives in a log cabin in the woods very close to his favorite river, the Brule. He is well known through out the Minnesota and Wisconsin steelhead circles as a fine steelheader. “BD” has fished throughout he Pacific Northwest as well; his favorite western steelhead river is the Toutle. The spectacular native summer run and winter run steelhead in this fine river were decimated when Mount St.Helens blew up in 1980. The fish have come back but Schumacher has not returned. He prefers the wild, naturalized steelhead of the Brule these days. “The steelhead in this river is a special strain of fish. They are very wild. A fresh, silver Brule Steelhead is an incredible fighter and as spectacular as the fish on the coast” He also enjoys fishing the many hatches of Wisconsin’s Rush River and floating the Upper Mississippi River and Chequamegon Bay for smallmouth. Schumacher has fished all over the western US, Ontario and most of Minnesota and Wisconsin as well. He also has several large Muskies to his credit from places like the Upper Mississippi River, Lake of the Woods and Rainy Lake. Greg Lonke (Also known as Sven Lonkila) is well known as a brilliant fisherman as well. He managed Burger Brothers Stores for 18 years worked at Galyans for 9 years and he is working in the fly fishing department at at the new Cabelas Store in Rogers Minnesota. “Sven” is a hard-core fly fisher; he enjoys fly fishing for smallmouth and fishing the Driftless Area trout streams. He has been presenting steelhead seminars for many years. He has fished all over the Great Lakes for steelhead and also spent a week on the famed Moisie River in Quebec fishing for that rivers world renowned Atlantic salmon. He has fished the Brule for over thirty years and has written in journals about the history of his experiences on the Brule. “Back in 1968 on the way home from the North Shore I jotted down some notes in s a spiral notebook about the trip and I’ve been doing it since then.” Going back and reading his journals is something that he enjoys. Fall is his favorite time of year. “Especially late fall - November” he says. Greg has a lot of respect for the Old Timers of the Brule. He has spent many hours sitting on the bank listening to old timers reminisce about the good old days. “If he pronounces January – ‘Yanuary’ then you better shut up and listen because you are about to learn something about fishing and be entertained in the process” Lonke recalls from his conversations with Brule Old Timers. These two men, Greg and Dennis bonded by a love of the Brule and its fish since meeting in 1969 purchased a wooded piece of land near the Brule in the early 1980’s. It became known as Trout Camp a place where there is camaraderie where gathering maple sap, eating a delicious venison dinner or sampling a home made Blueberry pie is just as important as fishing the Brule. Well, almost. 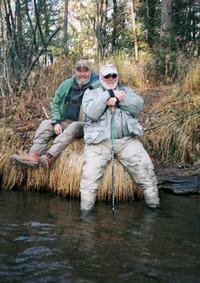 These two fly fishers met on a Minnesota steelhead river in 1969. This was a heady time in Lake Superior Steelhead history with the numbers of steelhead very high in all of the rivers north and south. Unfortunately there were a lot of fishermen as well. Greg recorded the numbers of fish and fishermen in his journal. “I get as kick out of people who talk about how crowded the river is now. They should have seen it in the ‘Good Old Days’. I like it better the way it is now. There are less fish and there are less fishermen but the catch rate is the same”. “The Sportsman of the future must get his satistions by enlarging himself rather than by enlarging his bag.” Aldo Leopold. Back in the early 1970’s Dennis and Greg were also among the very first to release steelhead. This was back in a day when trout were thought of as food. This was true in Montana or Michigan or Wisconsin. Prior to catch and realese regulations and trophy producing slot limits, Dennis and Greg pioneered the catch and release ethic on the Brule. Back in those days the numbers of fish seemed endless and the locals had no problem with catching and keeping their limit – several times each day. This was a source of conflict among many Brule area fishermen. Greg and Dennis were always on the side of the fish, to enhance the resource for everybody and to protect the numbers of special Brule Steelhead.